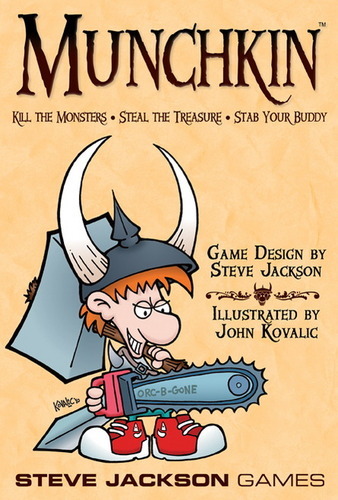 Munchkin is a hugely successful comedic fantasy card game for three to six players, originally released in 2001 and still in print today. The base set gently but reverentially ribs the Dungeon & Dragons role-playing universe. Designed by hobby gaming legend Steve Jackson (Car Wars, Ogre, Illuminati), games of Munchkin tend to last between one and two hours and have a strong take-that element, but while the game is all about combat people don’t get knocked out – you’ll all be in it until the end. There have been many ‘expansions’ (sets of extra cards) released for the game, extending the original theme and adding a lot of variety for seasoned players, while other base sets have riffed on everything from sci-fi and superheroes to Lovecraft and zombies. Munchkin has proved divisive in the board game community, being the pariah of ‘serious’ gamers in the same way boy bands and Transformers films upset music and film buffs. And similarly, despite purist objections and derision, it is available in more than 15 languages and has sold well over a million copies. While relatively simple, Munchkin is at its hardest at the outset as players are very much thrown in at the deep end. To start, each player is given a hand of cards: half from each of the ‘dungeon’ and ‘treasure’ decks (you’ll have a hand of four or eight, depending on which edition you play). If a player is dealt any ‘race’, ‘class’ or ‘equipment’ cards (elf, wizard, sword etc) they can play them in front of themselves immediately, starting to create their character. There is a lot of variety in the cards, so it’s best to encourage new players to have fun reading them and experiment in early rounds to get a feel for the game mechanisms. In a round, players take turns to flip a ‘dungeon’ card from the top of a shared draw pile. These take various forms, but what move the game on are creature cards. When drawn the current player will try to overpower it, facing the consequences of defeat or claiming loot if they defeat it. Defeated monsters give treasure, but more importantly a ‘level’ . Players start at level one – the first player to level 10 wins. These monster battles are the heart of the game. After a fight is declared other players can wade in either for or against you, or both. You and others can use equipment to help the cause, add extra monsters to make it harder, or offer your services to aid the fight – for a price, of course. The active player can choose to turn down the help of others, knowing they’ll probably have to give them treasure, or they may even get a level – but can they win without them? The writer: I’d be lying if I said I didn’t enjoy my first game of Munchkin, but I can also say I turn down any chance to play it now. The art and text is very well done, evoking the theme perfectly, while the rules and card layout are well conceived. But you only have to play a few slightly better designed card games to realise the gameplay harkens back to the bad old days of 80s gaming rather than the revolution of modern design this game was released at the height of. The thinker: Unfortunately this game suffers from two gaming conventions no serious strategist can abide: bash the leader and king-making. If I play well and get near level 10, others will use all the cards they’ve held back to scupper me; often letting someone else past to win. Why play a game for more than 20 minutes where success is rewarded with being dragged back into the mundane pack? I like a long game, but it must have substance to get that table time. This doesn’t come close. 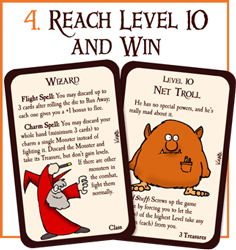 The trasher: For a long time I loved Munchkin; nothing beat throwing your mates under the bus and the to-and-fro of playing cards into epic battles. I’d still play now, especially with the right old group of friends, but do realise that this is a party game that simply goes on too long: there are so many better, shorter games available out there such as Coup, Dice Masters, The Resistance, Lost Legacy, Dungeon of Mandom, Epic Spell Wars…. The dabbler: There is something to be said for the charming card art and funny puns, and this has been a gateway game for quite a lot of people we know into the wider world of gaming, so at about £20 how can it be a bad thing? I’ve never been a role-player so don’t see the appeal, but for those growing up on RPGs its clearly got its charms. The rules are quick to pick up and it shows a clear path between two hobbies, helping draw new blood into the world of modern board games. Win win! Having already touched upon Munchkin’s game length, king-making issues and the inherent bash-the-leader problem, I think I’ve covered the three main gripes – and they are serious gripes. So let’s instead look at positive reviews: scanning through comments by fans of the game, you’ll find it described as hilarious, cut-throat, fun, satirical, mean, easy and cheesy. With almost 20,000 ratings at board game Geek, Munchkin sits with an average rating just above 6: perfectly respectable, especially when you consider Monopoly has less than 4.5 and risk just over 5.5. Whatever you may think of its merits, or lack thereof, Munchkin is miles from being universally hated – as some often rather snooty gamers may have you believe. What Munchkin really lacks, for a board gamer, is staying power. The rewards of the humour and artwork are fleeting, while the problems of the gameplay come to the fore in the first plays. But these may well not be problems for very casual gamers: this will be a game most often enjoyed by people with very few other games on their shelves, and there is absolutely no harm in that. With my game evangelist hat on, I applaud the job Steve Jackson Games has done in creating a gateway between RPG and hobby gamers that has lasted two decades: historically Munchkin should be talked of alongside Settlers of Catan and Ticket to Ride in the top division of introductory games into our hobby. But with my gamer hat on, unlike those other titles, I won’t touch it with a barge poll. In fact I’d rather sink £100 into Magic: The Gathering than £10 into Munchkin, even though I have no great desire to play Magic nowadays either. If you’re looking for a gift for someone already into the kinds of games I mentioned in the previous paragraph, this would be a pretty terrible choice. That said, the important thing to remember is that unlike some genuinely worthless games, Munchkin has its place. It is fun if you like D&D and aren’t interested in playing other card and board games; it is a good gift for younger fans who may be fans of the fantasy genre, possibly through Lord of the Rings or Harry Potter; and it can be fun for non-gamers who are very much into other geeky pastimes.